The development of the IECEx Scheme for Certification of Personnel Competency has created a new standard by which all plant owners can judge if they have competent staff looking after Ex equipment. It has long been recognised that the weakest link in the field of explosion protection is the competence of those installing, inspecting and maintaining the equipment. Much effort has gone into the development of these standards and of the related certification process to ensure that equipment delivered on site is free from sources of ignition. In Europe, the ATEX 'User' Directive 1999/92/EC reinforces the statements in the international standards in the IEC 60079 series, parts 10, 14, 17 and 19 which refer directly to the requirement to have competent people. This applies to those in charge of the operations (responsible persons) as well as the hands-on people (the operatives). 1. Basic principles of Ex Protection. 2. Classification of Hazardous Areas. 3. Installation of Equipment and Wiring Systems. 5. 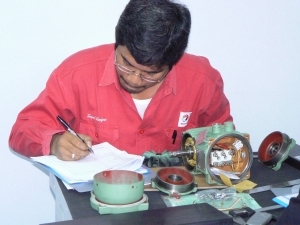 Overhaul and Repair of Equipment. 7. Visual and Close Inspection. Competence is more than simply being able to sit an exam after training. It is more about the sustained ability to correctly apply the knowledge and skills gained during both formal and on-the-job training. The IECEx Scheme requires validated evidence of how an individual has been performing, as well as the results of the exams, and this evidence is updated on a regular basis as part of certification maintenance. Existing CompEx Certified Operatives should be able to use their qualifications directly as part of the training input requirement to the process. Baseefa is one of the IECEx Certification Bodies that has contributed to the development of the scheme, and is in the first tranche of bodies to be assessed for their ability to operate the scheme. Baseefa is a world renowned certification body, principally concerned with electrical and mechanical equipment intended for use in potentially explosive atmospheres. The organisation is currently one of the largest organisations in the world dedicated to this type of work.